My Weekly Indicators piece is up at Seeking Alpha. If my reference frames are well- constructed, economic trends ought to start out in the long leading forecast, then start to show up in the short leading forecast, and finally make it through to the coincident nowcast. As usual, clicking through and reading is a way to help support my putting in the effort to describe and forecast the economy for you. We interrupt this coverage of the ongoing Trump Boom (c) to advise you that two more long leading indicators, while still positive, are showing at least some weaknesses. This story is up at Seeking Alpha. As usual, reading the story over there is both informative for you and a little $$$ revwarding for me. Also, as an aside, once corporate profits for Q3 are reported in two weeks as part of the revised GDP report, that will be a good time to do a comprehensive update of the long leading forrecast through 2019.
the first thing I am looking for is decelerating growth which will show up in a reading below 15 in the average of Regional Fed reports, and below 60 in ISM new orders. The ISM new orders index did fall below 60 to a new nearly 2 year low (but still positive!) at the beginning of this month. As of this morning, the average of the five Fed regional new orders indexes also declined from 18 to 15*, as the Empire Fed index fell slightly (from 22.5 to 20.4), and the Philly Fed index fell substantially (from 19.3 to 9.1). This could of course all be noise, but I've made a forecast, I've laid down some markers, and the data is - at least on an initial basis - hitting those markers. *(okay, technically not "below" 15, but close enough). With October consumer price inflation reported, let's update a few metrics. Real wages have still not even increased 1% in the last 2 1/2 years. we are likely to see a further decrease in inflation, so consumer purchasing power should increase. as the nominal increase in M1 surpassed inflation handily. Growth in real M1 had been decelerating, and was on the cusp of turning negative throughout the summer. But in the last two months it has rebounded. This is a good lesson in not simply projecting the trend in leading indicators forward -- because we never know when that trend may change. Sorry for the recent lack of posting on economic matters. Partly it is ennui, and partly it is a near total dearth of data in between the employment report a week ago Friday and tomorrow's CPI report. Even a couple of quarterly series I usually report on have been inexplicably delayed. Bernstein uses this graph to make the point that the changes in "real" wages in the last decade or so have been, more than anything, about the change in gas prices. Very true, but I think we can add some further comments. 1. Generally speaking, in the 1970s and 1980s, YoY real wages kept pace with CPI including gas prices. Beginning with the run-up in gas prices that started in 1999, they didn't. This tells us a lot about the presence of labor bargaining power in the 1970s vs. the absence of labor bargaining power in the last 20 years. 2. Note that YoY real wage gains started to decelerate in the mid-1960s before turning negative in about 1974. Thereafter the negative trend intensified, and only finally ended in the mid-1990s. This is powerful evidence that the massive entry of women into the labor force had a big depressing effect on wages. 3. The depressing effect on wages of a surge in the labor force serves as a natural experiment that powerfully contradicts the narrative by those like Matt Yglesias who incessantly reiterate the claim that immigration raises wages. If that were true, why shouldn't women's participation have had the same effect? 4. Note that renewed long term decelerating trend in real wage growth ex-gas since the late 1990s. 5. 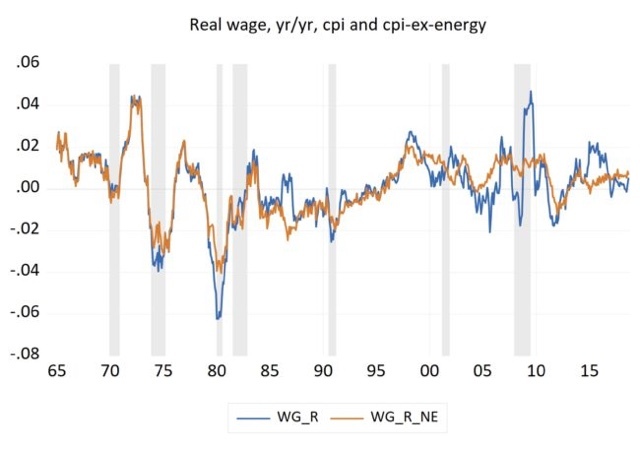 The above show us that the trend in "real wages ex-gas prices" gives us two further lessons in how long it takes for the lessons of changes in labor bargaining power to be internalized by both labor and management. It took almost 10 years from the time when women started entering the labor force en masse for the trend in real wages to actually turn negative (vs. deceleratingly positive). Once that secular force ended, as a whole employers only gradually learned that they could continually reduce annual raises. All of which suggests that it will take up to a decade of increased labor bargaining power for employers to internalize the necessity for bigger wage increases. Now that the 2018 midterm elections are behind us, let's take a preliminary look at 2020. It occurred to me that a decent baseline for that election is to simply take the total 2018 House votes for each state, assume that the Presidential vote in 2020 in each state will be the same, and apply that to the Electoral College. 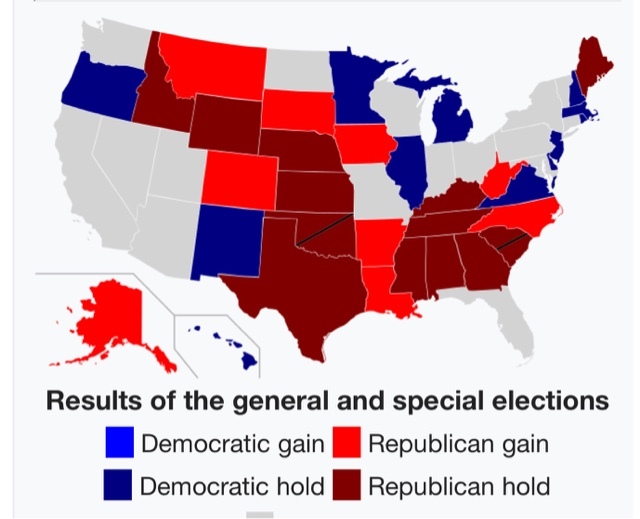 Alternatively, you could use the results of the 2018 Senate races in those states where there were races in 2018, and apply those results for those states. That's because the midterm turnout approached Presidential election levels, and Trump is going to engender the same intensity in two years as he did this past week. So, using the 2018 results as the template for 2020, who wins? If you apply the 2018 House votes to the Presidency in 2020, the Democratic candidate wins handily. As Nate Silver points out, it is a virtual duplicate of the 2012 map. 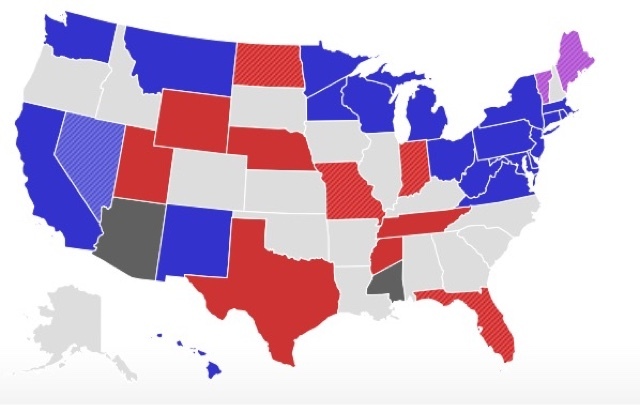 The only changes in the map for 2020 are that Florida flips to the Republican column, and Montana, Arizona, and West Virginia flip to the Democratic column. Again, the 2020 Democratic candidate wins if we apply this layer over the House map. In fact, even if we give Florida to the GOP, and don't give Montana, Arizona, and West Virginia to the Democrats, the democratic candidate still wins! In short, if the 2020 electorate is the same as the 2018 electorate, Donald Trump is going to be defeated. 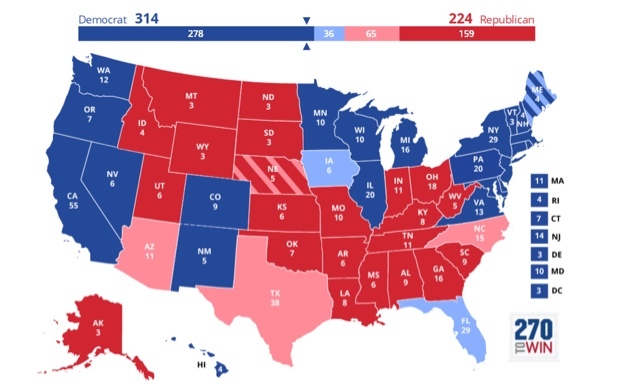 What this also tells us is that the upper Midwest is not lost to the democrats, and that the "blue wall" states that Hillary Clinton lost -- Pennsylvania, Michigan, and Wisconsin -- plus Iowa, are the states that the 2020 candidate most needs to focus on. Secondarily, states like Arizona and North Carolina should be targeted for insurance. Florida probably should get demoted to a "plan C" state. And "urban cosmopolitanism" isn't going to win back the upper midwest. A similar mix of economic issues (e.g., improving, expanding, and enhancing Obamacare) and social issues (particularly those issues most aggrieving women about the Trump-GOP party) are going to be necessary. There are a slew of seats all over Dixie and the high plains that simply aren't competitive for Democrats. They will probably need to flip at least 3 of the following 6 seats: Colorado, Iowa, North Carolina, Maine, Montana, or West Virginia. That is probably going to remain an uphill climb.